Hey, hey we all want to change the world some how…and in my case, I want to change the world by changing the health of the world both people and planet. By now (after reading my ramblings) you should know that a large percentage of you food supply is genetically altered, sprayed with chemicals, given hormones, grown too fast in deficient/ nutrient poor soil. As Arlo would say our food gets “injected, inspected, detected, infected, neglected, selected” and much more. I am thinking we need a revolution, not only to save our health but save the planet. Here is what I propose…. let us put an end to this crazy toxic cycle, now! We have more than enough statistic to show we have an increase of cancer, ADD, ADHD, Autism, food allergies, autoimmune disease, endocrine disorders, diabetes, etc. Instead of thinking about, cutting out, printing out all these fabulous Green articles, let’s get off our asses and DO something. “There are watchers and doers in this world.” Tired of sitting on the sidelines? Let’s support the health/ green revolution…..let’s support organic farming- it is cheaper than a medical bill. Local farmer’s markets are then best deal plus there are CSA (community supported agriculture) To find a list of your nearest CSA click here. Not only do you get better food you help save the planet by reducing your carbon foot print because the food is not traveling from across the country or world for that matter, plus there is less packaging, bring your own bag that you can reuse and you will be my hero. 5 Ways to save your health and the planet– not any shocking new ideas just many more good reasons to do them! 1. STOP BUYING BOTTLED WATER– get a filter to instal on your sink and a reusable water bottle preferably stainless steel, glass, or BPA-free plastic bottle (still not my favorite choice). Water is very important- filtered water is better than many bottled water due to the high acidity level of many bottled waters. Maintaining a more alkaline pH is far healthier. From increased energy to the prevention of cancer, alkaline foods/drinks and a healthy pH balance have been revered as a universal remedy in modern culture. See how acidic bottled water is! Best of all we can help add to the pollution of our earth. See plastic islands in the Pacific ocean. 2. BUY LOCAL ORGANIC. Many farms offer subscriptions for weekly baskets of produce, flowers and many other farm products. Try a CSA this year! How to choose a CSA. 3. REUSE SHOPPING BAGS FOR ALL SHOPPING. 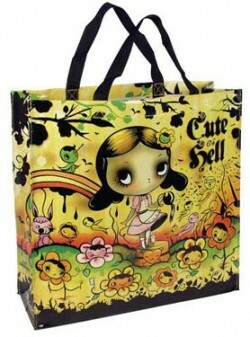 So you can make a statement with a great bag for grocery shopping as well as shopping for a new pair of shoes. You can reuse a bag you have, buy a cool new one to use, or make one- there is no excuse not to have a bag. Hell, I will personally make you one if you email me a good reason why you want one and promise to use it every time you shop. 4. WALK, RIDE, SHARE– Ok it is freaking 113 degrees here! So I do love my A/C car, however, when the temperature drops I will be making my wee 2 mile commute via bike; for now I will be carpooling with my love. Not only will I be saving the environment by biking but improving my cardio health, sculpting my legs and backside too- not a bad deal. 5. NEW TO YOU- Buying gently used items is good for the earth, good for your finances and good for your health. Yes, it is good for your health because to poor guy who originally paid full price for the item also breathed in all the toxins that item off-gassed. New furniture, new clothes, new cars (that new car smell is toxic!) etc off-gas (the evaporation of volatile chemicals in non-metallic materials at normal atmospheric pressure). Many of the chemicals are carcinogenic, lung irritants, endocrine disruptors, and just plain nasty to you lovely bodies. So if you buy use you save money/reduce financial stress, keep your indoor pollution down, plus if you good to garage sales or use Craig’s list you help build community by meeting new people. You may want to stay informed about going green. Sign up for weekly newsletter or subscribe to World Watch, an award-winning magazine. This is my shopping bag that I purchased in a thrift store, which I go to via subway. You too can be this cool. Previous postOoo, I love that shade of toxic pink!